Behera et al. show that cytosolic Ca2+ transients induced by different stimuli are linked to cytosolic pH transients. Plant Cell https://doi.org/10.1105/tpc.18.00655. By Alex Costa (University of Milan), Richard Morris (John Innes Centre, Norwich Research Park), and Markus Schwarzländer (University of Münster). 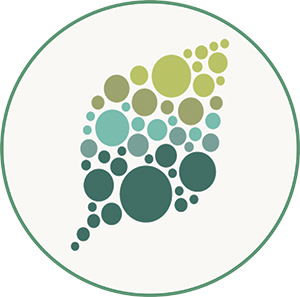 Background: Plants survive by adapting their development and physiology to external changes. Information within cells is commonly encoded in calcium signals; different external stimuli are translated into changes in the cytosolic calcium ion concentration. Such calcium signals are decoded by a range of calcium sensors. An unresolved problem in calcium signaling is how a simple ion encodes complex information with high specificity. Calcium signals may operate in concert with other second messengers, and protons have been suggested as candidates. Several proteins that transport calcium ions across plant membranes also transport protons, and there is evidence from other systems, such as growing pollen tubes, that supports a connection between cytosolic calcium and pH dynamics. Question: Building on a body of previous work, we considered protons as a potential signal and investigated the link with calcium. We tested the generality of this coupling signaling by monitoring changes in both calcium and pH for a variety of external stimuli. 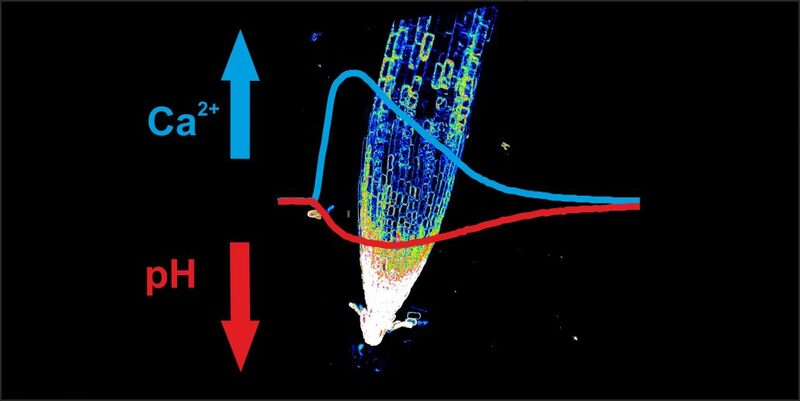 Findings: Using modern imaging microscopy technologies and genetically encoded fluorescent biosensors, we monitored calcium and protons at high resolution within living cells and demonstrated that cytosolic calcium and pH dynamics are linked in both leaf and root cells of Arabidopsis subjected to external stimuli. Specifically, when a cytosolic calcium increase occurs, cytosolic pH decreases. In membrane transport mutants and in response to chemical treatments that perturb calcium and proton homeostasis, the link was maintained, indicating its robustness. However, the link was modified in cell organelles. While their internal pH was dominated by the cytosol, calcium dynamics differed, pointing to modulation at the subcellular level, which could provide a basis for encoding intracellular signals. 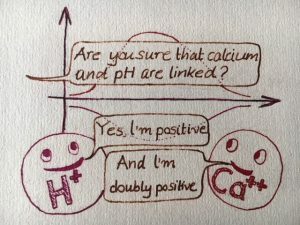 Next steps: We have demonstrated that pH and calcium are linked, but the underlying mechanism is unknown. The finding that the responses are similar, but not strictly correlated, and in some cases delayed, points to something more complex than would be expected from a simple transporter model or joint buffers. Using multiparametric imaging across a range of stimuli with further chemical and genetic perturbations coupled with the development of mechanistic models will help unravel these fascinating observations. Smrutisanjita Behera, Zhaolong Xu, Laura Luoni, Maria Cristina Bonza, Fabrizio Gandolfo Doccula, Maria Ida De Michelis, Richard J. Morris, Markus Schwarzländer, Alex Costa. (2018). Cellular Ca2+ Signals Generate Defined pH Signatures in Plants. Plant Cell 30: 2704-2719; DOI: https://doi.org/10.1105/tpc.18.00655.